Ulster secured top spot in the RaboDirect PRO12 thanks to a 37-13 triumph over Cardiff Blues in the final round of matches in the regular season. The Ravenhill side ran in four tries in total and managed to come through for the win despite being 13-10 down at half-time. Dafydd Hewitt got the away side off to the perfect start with a try after four minutes, with Rhys Patchell adding a further eight points in the first-half, but Ulster got back in the game thanks to Ruan Pienaar's 10 points - a try, a penalty and a conversion. 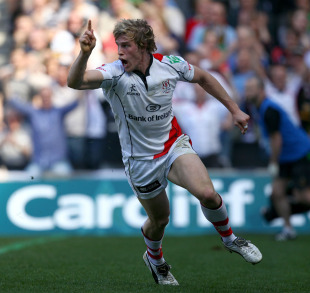 And come the second-half it was all Ulster with Andrew Trimble grabbing a brace of tries while Robbie Diack crossed late on to secure the bonus point. They will now have a home semi-final on Friday May 10. Ulster's Irish rivals Leinster finished second in the PRO12, bagging a home semi-final in the process, thanks to a 37-19 win over the Ospreys at the RDS. With their coach Joe Schmidt leaving at the end of the season for the Ireland job, the Dublin province will hope to give their Kiwi coach a good send-off with some silverware. And their hero on the night was Andrew Conway who grabbed a hat-trick of scores while Cian Healy scored the bonus point try with Jonathan Sexton slotting 15 points with the boot. The Ospreys had a chance of progressing to the play-off stages but they had to win at the RDS. They put in a valiant effort with Dan Biggar, Ross Jones and Thomas Isaacs scoring tries, but in the end they proved to be nothing more than consolation scores with the Swansea-based region ending the season in fifth. Their loss in Dublin let off the Scarlets who started in fourth place at the start of the day and four points ahead of the Ospreys. The men from Llanelli suffered a shock 41-17 loss at home to Treviso but still booked their place in the play-offs. It was a dominant performance from the Italian side with Treviso crossing for four tries with Robert Barbieri, Manoa Vosawai, Luca Morisi and Christian Loamanu all going over. The Scarlets only mustered 12 points from the boot of Leicester-bound Owen Williams along with Liam Williams' last gasp try. The Scarlets will now play Ulster in the semi-finals of the PRO12 while Glasgow secured third place with a hard-fought 20-3 win over Connacht in Galway. In Eric Elwood's final match in charge of the Irish side, they never got a foot hold in the match with Dan Parks' sole penalty the only points they managed to muster. In turn, the Warriors shone with DTH Van der Merwe and Sean Maitland, who was named in the British & Irish Lions squad earlier this week, grabbing Glasgow's scores. The result sees Glagow travel to Leinster in the other PRO12 semi-final. Elsewhere in the league Edinburgh finished their season on a high note with a 31-24 win over the Dragons. Both teams bagged three tries with the Scottish side's scores coming from Greig Tonks, Greig Laidlaw and Netani Talei while the Newport region's tries came from Steffan Jones, Dan Lydiate and Tom Prydie. Friday's earlier match saw Munster survive a scare against winless Zebre to end their season with a 27-25 victory. Zebre bagged two tries with Sinioti Sinoti and Giovanbattista Venditti going over while Ronan O'Murphy, Patrick Butler and BJ Botha scored for Munster.